Artists of Ballet West in George Balanchine’s Emeralds. Photo by Beau Pearson. While George Balanchine’s Jewels may be best known as the first full-length abstract ballet, I find its magnificence resides in other features: its brilliant display of ballet’s history and the ways dancers and music convey different moods or atmospheres. Ultimately, I find the three sections of Jewels speak to the values of diversity and inclusivity, and by extension to the importance of honoring different artists and cultures. This was especially apparent Saturday night when there was a special ceremony for Bruce Caldwell, honoring his 50 years of work with Ballet West as a dancer and currently as ballet master and company archivist. As the audience applauded at the end of the performance, Caldwell was on stage to receive a rose from many partners he worked with during his dancing career, including Jane Wood, Maggie Tesch, and Sharee Lane. It was a poignant acknowledgement of the commitment and love dancers bring to their profession. 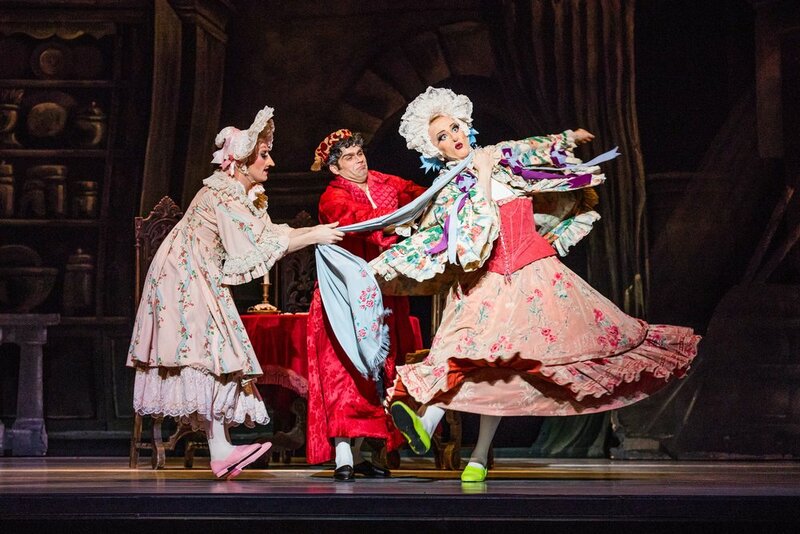 It was also a fitting ending to a ballet that has a celebratory vibe: the richness of the costumes in Jewels, plus the size of the cast (34 dancers are on stage for the polonaise that closes the performance), make the evening a dazzling affair. On Saturday night I found the women in particular, both in leading roles as well as in the corps, were exceptional. Emeralds, the first section, set to music by Gabriel Fauré, was a dreamlike series of encounters, and Katlyn Addison and Emily Adams were exquisite. They conveyed the sense of mystery and detachment that makes me think of Romantic ballet when I watch Emeralds. 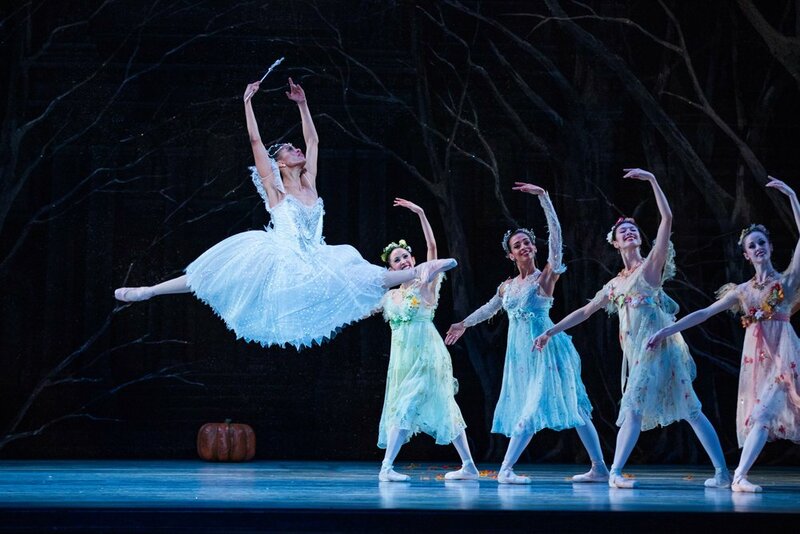 The longer tutus (designed by Barbara Karinska) recall the costumes of La Sylphide or Giselle, and the relationships between the men and women tend to be unresolved. There were lush, reaching gestures that looked like the dancers were being swept and blown through the phrases. A pas de deux ended with the dancers walking backwards into the wings, their chests lifted to the sky in a moment of reverie or surrender. The ballet ended with three men kneeling and raising one arm towards the wings, a gesture that evoked a sense of longing since the women had just exited. In last night’s performance it seemed to mark a moment of gratitude for the elegance of these women. The 10 women in the corps were incandescent: their bourrées suggested the shimmering of a gem. This was especially impressive Saturday night because the cast included dancers of Ballet West II––Jordan DePina, Savannah Lyle, Alexandra Terry, and Victoria Vassos­­––who blended seamlessly with the company members. 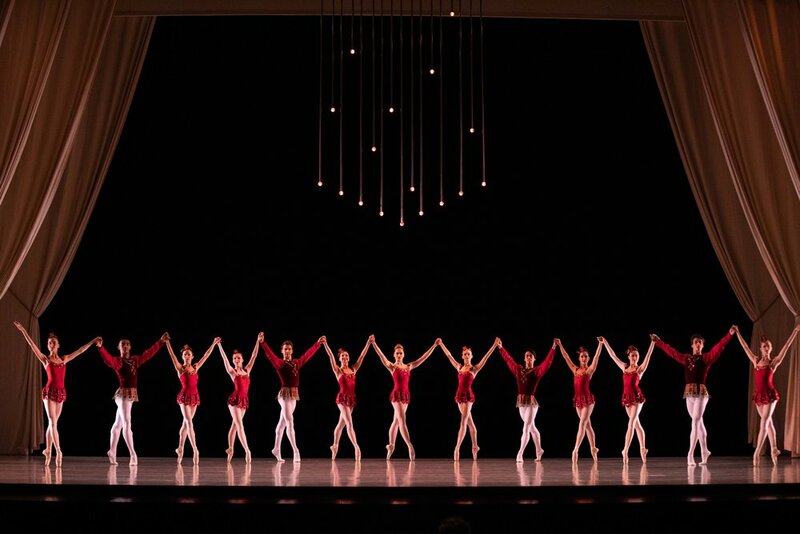 Artists of Ballet West in George Balanchine’s Rubies. Photo by Beau Pearson. Rubies presented the slinky atmosphere of a jazz club (Igor Stravinsky’s score for this section was first performed in 1929). The section opened with the dancers standing in 4th position, arms high in V-like shapes, with the women en pointe. They jutted their hips with sassy thrusts and instantly the reverie of Emeralds dissipated: now we were in the land of “cool.” On Saturday night the four men, Kyle Davis, David Huffmire, Ryo Munakata, and Joshua Shutkind, were riveting: exquisite in their execution of fast phrases and precise steps. When they partnered Addison, who appeared regal and queen-like in Rubies, they attentively placed her wrists and ankles in développé and arabesque positions. They seemed to be displaying her fantastic lines like a ruby would be displayed on a pedestal; and Addison’s confidence recalled other powerful women in Balanchine’s repertory, like the Siren in Prodigal Son. Her headpiece made me think of the crown worn by Wonder Woman, an apt comparison given that Addison stepped into this leading role in Rubies for Emily Neale just after performing in Emeralds. Other corps dancers who shone in this section included Jenna Rae Herrera and Chelsea Keefer, both soloists with the company, who performed with an infectious joie de vivre. The moment the curtain opened for Diamonds, there was applause from the audience. This section recreated the stately opulence of Tsarist Russia. The score by Peter Ilyich Tchaikovsky and the white tutus worn by the corps of 12 women conveyed the refined sophistication of a royal ball. Typical of Balanchine’s ballets, the corps took a central role and again the dancers included members from Ballet West II––Terry and Vassos plus Cy Doherty, Robert Fowler, Noel Jensen, Joseph Lynch, and Jake Preece––who contributed to the magnificent vision of courtly elegance. In the leading roles, Beckanne Sisk and Chase O’Connell were gorgeous, and special moments included the way he knelt to her during the beginning of their pas de deux, as if to ask, “Can I have the honor of dancing with you?” Their solos, especially his execution of à la seconde turns, were phenomenal, and again the audience applauded. Sisk’s choreography included gestures that recalled Swan Lake, with arms like wings, yet without any reference to a specific character or narrative. Instead these moments, that evoked the 19th century, reminded me how Balanchine was updating ballet’s vocabulary, making it relevant to the 20th century. On Saturday night there were exceptional performances by female soloists––Gabrielle Salvatto, Katie Critchlow, Chelsea Keefer, and Amber Miller––who danced with the speed, precision, and joy that are Balanchine’s trademarks. 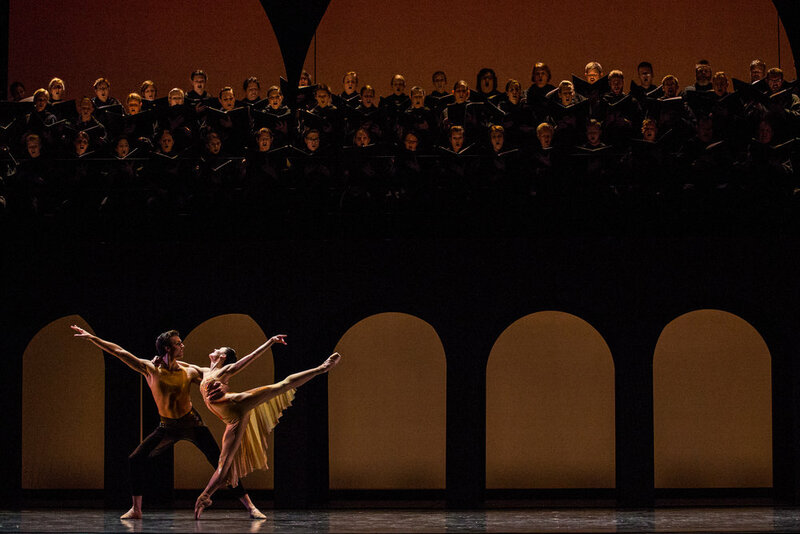 They continually captured my attention, an impressive feat when the cast numbered 34 dancers. Artists of Ballet West in George Balanchine’s Diamonds. Photo by Beau Pearson. A week before this performance I watched a rehearsal of this section led by Sandra Jennings, who performed, and now stages, Balanchine’s repertory. Her cues to the dancers to “really step out” while maintaining exact positions, revealed the ways that Balanchine extended the classical vocabulary. Jennings’s attention to detail was impressive: noticing how a slight shift in a dancer’s shoulder in arabesque distorted the feeling of uniformity among the soloists. I imagine Jennings would have appreciated how thoroughly the cast embraced her directions and presented a gorgeous performance of Balanchine’s aesthetic. A through-line of the evening was the exceptional music, conducted by Jared Oaks, Ballet West’s music director. Each section conveyed a different characteristic, from dream-like to jazzy to elegant, that was generated by the musicians as well as the dancers. Jewels is known for its close connections between the scores and the steps, and any time musicians and dancers are working well together, there’s a distinct synchronicity: we are watching how artists in the orchestra and artists on stage are generating this work of art collaboratively. When I attended the rehearsal led by Jennings, I noticed that Oaks was present as well: his deep knowledge of the dancers’ needs, combined with his attentive conducting, made watching Ballet West perform Balanchine’s ballet an extraordinary experience. The costumes, courtesy of Cincinnati Ballet and Pacific Northwest Ballet, added to the evening’s glamour, and it was exciting to see how each jewel’s costume was created by combining multiple shades of its color: green for emerald, red for ruby, and white for diamond. 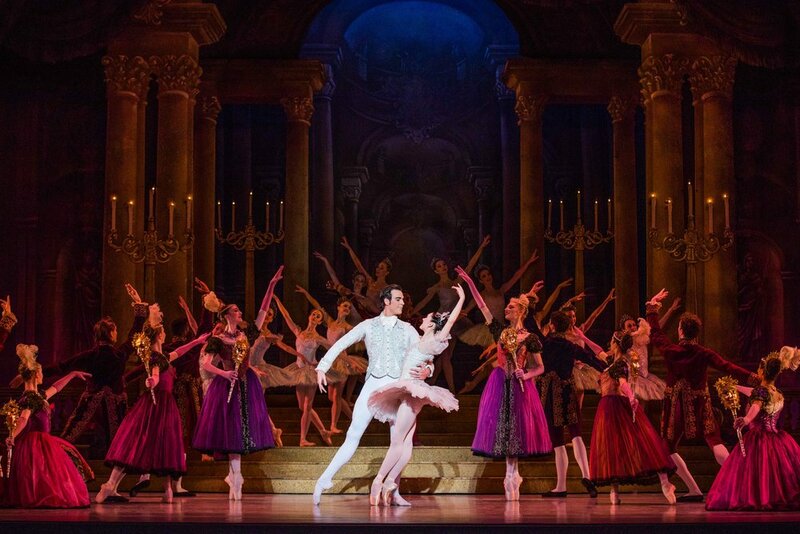 This diversity added to the ballet’s theme of embracing multiple nations and styles. When Balanchine made this ballet in 1967, he was fortunate to be working with a special cast of artists: Violette Verdy and Conrad Ludlow, Mimi Paul and Francisco Moncion; Patricia McBride, Edward Villella, and Patricia Neary; Suzanne Farrell and Jacques d’Amboise. What was exciting about Ballet West’s production last night was noticing how many talented artists in Ballet West II could become new members of the company, and how many artists in the company, like Kyle Davis, Jenna Rae Herrera, Chelsea Keefer, and Gabrielle Salvatto, are thriving and could soon be moving into more featured roles. Just like Jewels is a celebration of different countries, as well as artists from different countries, Ballet West is a company that has a rich diversity of dancers in terms of backgrounds, body types, and countries of origin. At this particular moment in the States, I find this celebration of difference an important message about the richness of cultural diversity, and the contributions that people from many nations make to our definitions of what it means to be American.